Last Saturday night, I went the Asian Counselling and Referral Services (ACRS) Annual Benefit Gala. The theme was “A Culinary Journey” as different Asian-American chefs prepared separate courses for the night. The evening was a superb dining experience as well as a smashing success for raising donations. More than $80,000 were publicly pledged. The night was also very inspiring as a young woman who had benefited from ACRS services gave a moving testimony of her life experiences. She, a daughter to a Cambodian immigrant couple struggling with drug addiction, was neglected and physically abused as a young child. At the age of 9, she was sexually abused by a cousin. She struggled in school and was referred to ACRS. Later while working at a gentlemen’s club, she was seduced and kidnapped into the human trafficking trade and forced to do drugs on a daily basis. After a few arrests, she was able to escape from her kidnapper and returned to Seattle. ACRS has since been instrumental in her recovery. What’s really extraordinary is that she doesn’t want to dwell on her past but rather use all her experiences as motivation to move forward. She wants to help others who are surviving similar circumstances. Her ambition is to return to school and eventually become a lawyer. She told her story without shame or grandiose. While most of us were quite shocked by her story, it seemed clear that she just wanted to focus on her future and what she could do to impact the world moving forward. To me, that was the most inspiring part of her story. How many of us dwell too much on our past and are unable to move on? We can all learn so much from her resolve and willingness to move forward. Top Chef Seattle Kristen Kish prepared the main course with braised short ribs. 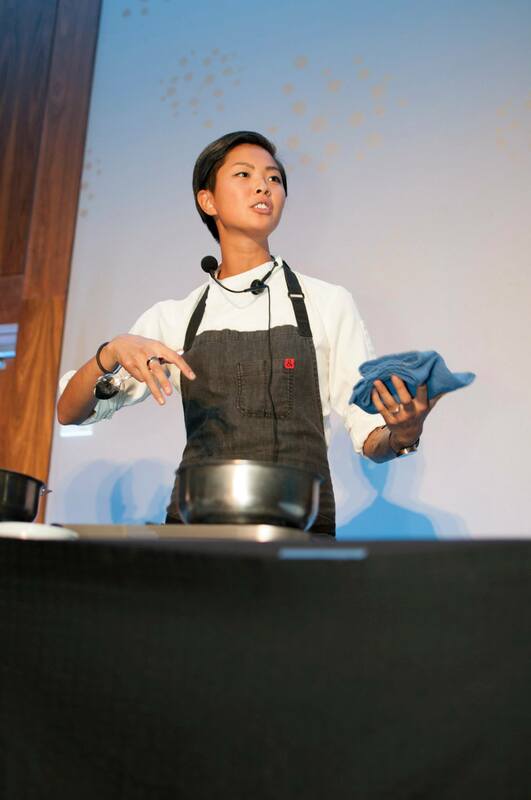 Posted in People & Culture and tagged ACRS, Kristen Kish. Bookmark the permalink.